Google is on a tear adding new features to Google Drive. The company recently rolled out an improvement to how Gmail handles Drive attachments, as well as some nice feature updates to Drive for Android and iOS. Two years after Google added the ability to share Drive links via Gmail with just one click, the company is now adding the ability to send actual attachments using the same mechanism. Google's productivity suite also gained the ability to handle Open document formats—ODT, ODS, and ODP—which should come in handy for Linux lovers and users in countries that have adopted Open formats over their proprietary counterparts, like Microsoft's DOCX. Drive for Android, meanwhile, is getting Google Now integration, which lets you use an "Ok Google" voice command to search for Drive documents. And users of iPhone and iPads are getting the ability to upload content from other apps on their device. The impact on you at home: Earlier in December, Google added one-click editing capabilities to Gmail for Microsoft Office attachments. Before that, Google came up with a Chrome extension that lets you launch desktop apps from Google Drive. 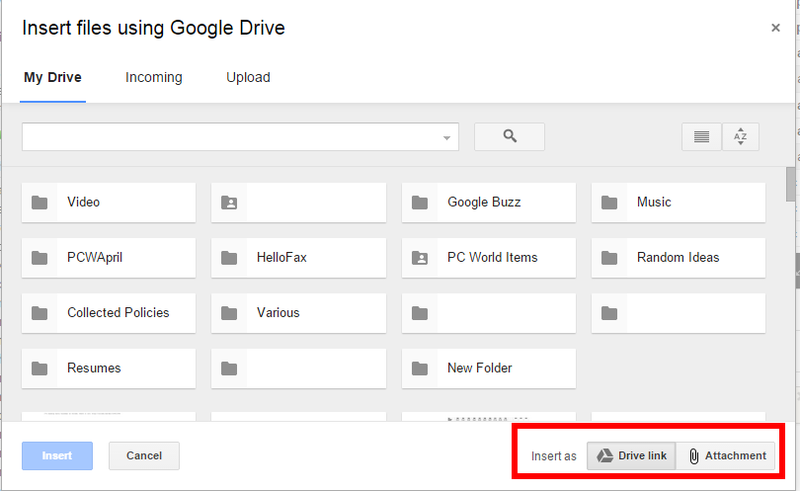 Now, we're getting a few more functionality boosts to Drive as Google continues its Drive bonanza to help ward off defections to Microsoft's OneDrive and the Microsoft Office web and desktop ecosystem. Google's new Gmail functionality is available now. To use it, click the Google Drive icon in the compose window in Gmail. A pop-up window will appear displaying your Drive contents. At the bottom right corner of the window you'll now see two options to insert a file either as a Drive link or an attachment. 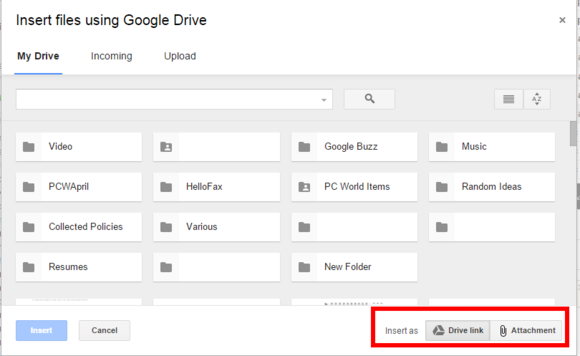 Google Drive formats can only be shared as a Drive link, which makes sense since only Google Docs can open Drive files. Non-Google Drive files, however, such as Word documents, images, and PDFs can either be shared as a Drive link or sent as an attachment. Once you've chosen your file and how you'd like to share it, click the Insert button and you're ready to go. As for the mobile features, they should be pretty self-explanatory. Android users can test to see if they have the new Google Now functionality by telling Google to search in Drive. Let's say, for example, that you're searching for a spreadsheet called "December expenses" in Drive. Say to your phone, "Ok, Google search for December expenses on Drive." If that command surfaces the document then the functionality is active on your device. If not, you may have to wait a few days as Google rolls out the new feature over the next week. The iOS update to Drive is available now. One last feature Google has added for both Android and iOS users is the ability to use Drive to access and share maps created with Google My Maps.